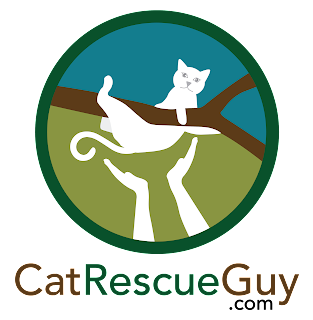 I had been longing for an easy rescue, and this time I got my wish. Not only was Truffles a model, cooperative cat, she was also located very close to my own neighborhood. 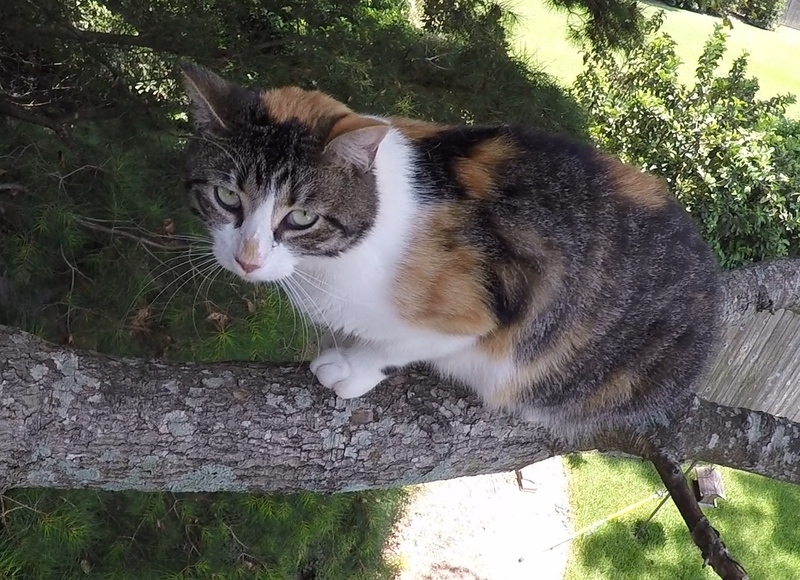 Truffles is a sweet, outdoor calico that became stuck in a tree in her own backyard. She had been in the tree only one night, but the extreme heat of the days had left her panting and dehydrated. She was suffering, and she really needed to come down to get some water and cool off. She was less than 20 feet high so my ascent was pretty quick. She stayed in place while I came up to her and was not afraid of me. That is what I love to see. I let her sniff my hand, and she let me touch her. At one point she turned around and walked a few steps farther out on the branch away from me, but she quickly turned around and came back. I pulled out a can of food to see if she was interested. I was told that she had never had canned food before, so I was not sure what to expect. I gave her a small spoon of the wet food, and she readily licked it up. Now that she was interested in the food, I placed it in the back of the carrier to see if she would walk into it. Like most cats, she thought about it a minute but then walked in. I closed the door and brought her down. She was already in her own territory, so she was released right there. She is an outdoor cat and never goes inside. Hopefully, she won't ever need to go up another tree as well. Truffles is lucky to have such a nice family. They were exceptionally gracious, accommodating, and enjoyable people. They were very relieved to have their Truffles down and safe again, and I was very happy to have a hand in making that happen. The next day they reported that Truffles was doing great and back to her old self again.